Today the red company launched one of the fastest mobile graphic card solution to the market, to add another choice for the enthusiast notebook mobile gamers, featuring the new AMD's Graphics Core Next (GCN) architecture. 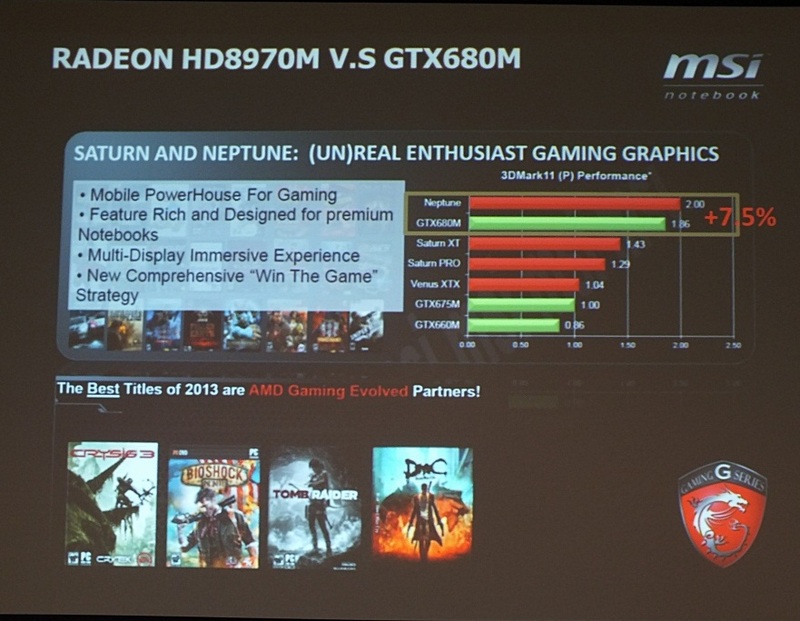 He mention that "When developing our new gaming notebook, the MSI GX70, we required a graphics card that would truly enhance the gaming experience. The AMD Radeon HD 8970M graphics card exceeded our expectations," said Eric Kuo, vice president for Global Sales and Marketing, MSI Notebook. "Its speed, features and intelligent power capabilities perfectly complement our product. The GX70 is surely designed for professional and top tier gamers." 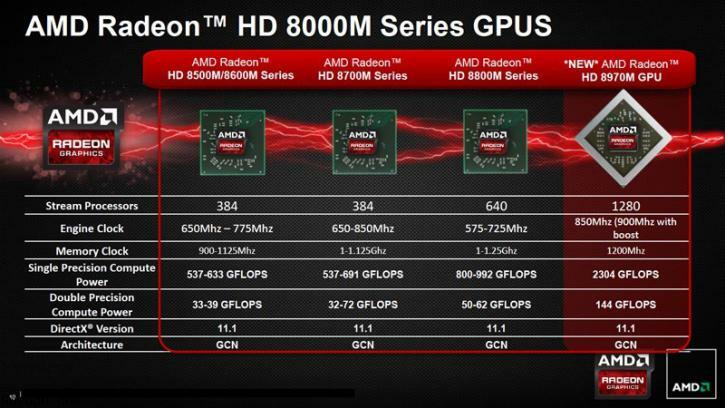 Speed: Featuring AMD's GCN Architecture, the AMD Radeon HD 8970M GPU is built for speed and designed from the ground up to provide the best experience in the top PC games for today and tomorrow. 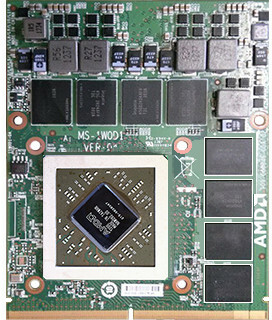 Intelligent Power Features: AMD's Enduro Technology allows the AMD Radeon HD 8970M GPU to optimize battery life. The power features are inherently dynamic, delivering instant performance when needed and adjusting GPU requirements when in idle mode. Multi-Display Optimization: AMD Eyefinity technology allows for the highest quality multi-display gaming spread across several different monitors, creating an immersive experience. Engineered for Compute: AMD App Acceleration harnesses the compute power of the AMD Radeon GPU to take workload off the CPU and provide unprecedented performance in everyday applications. 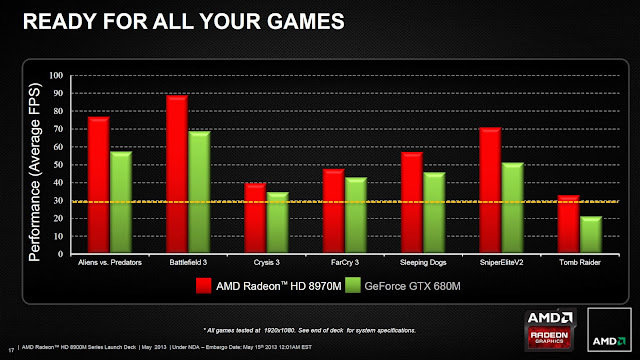 The AMD Radeon HD 8970M GPU offers improved performance and enhanced visual effects5. Unparalleled Image Quality & Video Playback: The AMD Radeon HD 8970M GPU is the ideal entertainment and productivity tool that provides smooth video playback and maximizes image quality for all of your multimedia needs. DirectX 11.1 Support: Offers full support for DirectX 11.1 and Windows 8 for all of today and tomorrow's games and applications. Another Benchmark comparison between the HD 8970M Vs Geforce GTX680M prove a performance gain up to 20%.